Traditions can only exist if they are handed down from one generation to the next. But they can only be improved and made even more popular through an individual’s original contributions. The Band was that rare ensemble that excelled at both. The Band’s leader Robbie Robertson literally spent years studying at the side of Bob Dylan and before that, was an astute student of the ’50s Tin Pan Alley hitmakers. This apprenticeship paid large dividends, as Robertson developed into a songwriter with an uncanny ability to pen cinematic songs that harkened back to the very best of American roots music, but at the same time sounded thoroughly fresh and original. Remarking about the inclusion of a plaintive cover of folk standard, “Long Black Veil,” on the group’s legendary debut album, “Music From Big Pink,” Robertson went straight to the point. Little did Robertson know that his and his Band-mates’ music would inspire similar reverence amongst their classic-rock contemporaries like the Beatles, the Rolling Stones, the Eagles and Neil Young, as well latter generations of musicians. From the Band’s roots-steeped music, an entire sub-genre of rock music, alt-country, would emerge and flourish carrying on like-minded traditionalism through to today. To repay that debt, a new tribute album, titled “Endless Highway: The Music Of The Band,” drew a diverse if not awe-inspiring roster of talent who feel the same as Robertson about the Band’s music — from ’60s chums the Allman Brothers Band to lower-echelon country stars like Roseanne Cash and Lee Ann Womack to pop-rockers Death Cab For Cutie. In most instances, however, some of these guys should have best left these new traditionals alone. The first obstacle facing this disc is the fact that the Band’s songbook is fairly limited. It consists of two indisputably classic albums, one lesser but still great record and a scattering of memorable tracks all put to vinyl between the late ’60s and very early ’70s. Besides that, what remains of the Band’s legacy is a death-row roster of horrendous LPs in which the group’s creative spark was drowned by subpar material, substance abuse and infighting. 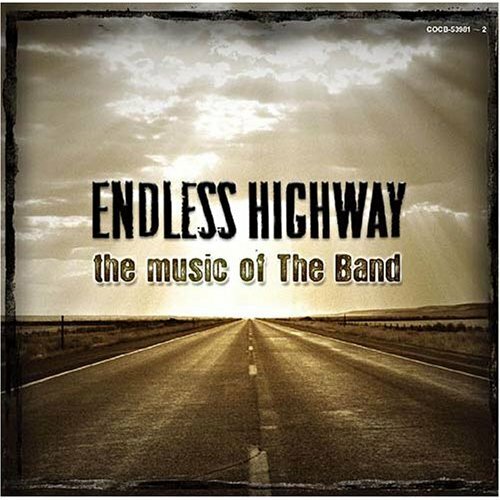 As a result, “Endless Highway: The Music Of The Band” is 17 songs of the usual suspects, their greatest hits. An even greater problem with “Endless Highway” is one that affects nearly all tribute albums: a lack of originality. Doing cover songs — like reunions or overseas military engagements — requires a clearly defined purpose and new energy. Artists don’t necessarily need to completely rearrange a familiar hit, but at least, they must inject something of themselves or bring greater emphasis to a new aspect of a song. Otherwise, what’s the point? As was the case with “Long Black Veil,” the Band wasn’t averse to doing the occasional cover — old country ditties and previous Motown hits as well as folk-music favorites — but they always treated the track as they would their own. For them, everything was rife for re-invention. Many of musicians who appear on “Endless Highway” aren’t as bold, and this record often seems like highly-produced rock-star karaoke. Some artists approach the Band’s songs timidly, just rehashing the classics. Others just seem dwarfed by the original performances or bettering the vocals laid down by the group’s trio of singers, Levon Helm, Richard Manuel and Rick Danko. Questions remain what others were thinking at all. Keyboardist (and quasi-member of the ’90s Grateful Dead) Bruce Hornsby was thinking of smarmy likeability with his dense and largely bland version of “King Harvest.” So, too, did Blues Traveler, whose smoothed-out, jive-y take on “Rag Mama Rag,” features frontman John Popper’s malleable harp playing subbing for the famous fiddle part. The production of both tracks swaps rustic overtones for cheap gloss. It gets worse from there. The Allman Brothers Band’s attempt at “The Night They Drove Old Dixie Down” was recorded live and is ragged. The song whimpers along. It doesn’t help that keyboardist/singer/namesake Gregg Allman sings like he’s dry-heaving, muffs the lyrics and the rest of the group chimes in like haggard hound dogs. Meanwhile, Lee Ann Womack could be tried and convicted for turning the once-haunting beauty of “The Weight” into a soulless, staged production. Rubbing up against those travesties are more noble efforts. Jam-scene singer-songwriter Jack Johnson and Roseanne Cash are pleasant on “I Shall Be Released” and “Unfaithful Servant,” if not taxing their creativity. Other performers just lack the instrumental prowess that the Band commanded. The Wallflowers’ Jakob Dylan deserves points for singing “Whispering Pines” in a higher register, but he doesn’t have the range or the emotive qualities to accomplish his mission. The same fate befalls Death Cab For Cutie, who slow “Rockin’ Chair” way down and strip it of any of the original’s vocal repartee for the sake of lone singer Ben Gibbard. Most surprising, it’s the jam bands that appear on “Endless Highway” who really toy with the source material and come up with the best renditions. My Morning Jacket have played “It Makes No Difference” — perhaps rock’s most lovely ode to self-pity ever — during their recent tours and really project the song like they were trying to please a stadium filled with lonely hearts. Fellow noodlers Widespread Panic transform “Chest Fever” into how it should have sounded at “The Last Waltz” with full horn section accompaniment if the Band hadn’t played their farewell gig like they were coked out of their minds. Taking pointers from Dylan’s original arrangement of the song, Guster turn in a gloriously ramshackle “This Wheel’s On Fire” with a banjo, layers of acoustic guitars and subtle Hammond organ. The loose-sounding version even surpasses the Band’s. The project organizers wound up getting more songs than they could or would put on the album, which meant performances by the Warren Haynes-led Gov’t Mule, singer-songwriter Joe Henry, the comically-named ALO (Animal Liberation Orchestra) and collaboration between John Hiatt and the North Mississippi All-Stars were all left on the cutting-room floor (although the three tracks can be heard in their entirety by visiting the label’s Web site). Why some were left out seems obvious enough. The Mule’s hippie-rock rendition of “The Shape I’m In,” with the unlikely fusion of a wah-wah pedal and slide guitar, seemed to capture the ’60s psychedelic backdrop of the era and contains little of the original version’s blunt charm. Both ALO and Hiatt and the All-Stars do overly loyal readings. In the case of the latter, they try to recreate folk legend Leadbelly’s “Ain’t No More Cane,” which the Band covered and effectively claimed as their own. The Band’s arrangement emphasized a hydra of unusual and robust voices. Hiatt and company just don’t have the vocal firepower to match it. Only the exclusion of Joe Henry’s version of “Bessie Smith,” which was a hidden gem on the storied “Basement Tapes” cut with Dylan, deserves a spot on the record. Unlike so many of the performers here, Henry seems to understand the musical dynamics that the Band emphasized in their music. As such, he produces an original and suitably funky arrangement of the tune with accents of mandolin. As Henry himself has proved in his recent production work with Elvis Costello, soul legend Solomon Burke or folkie icon Ani Defranco, there’s a difference between working in a genre of music and obeying its strictures versus just repeating what came before. If “Endless Highway” fails to fully do justice to the Band’s achievement, it’s because few seem to understand their approach and appear ready for such a challenge. The album’s most important asset isn’t itself, but what it might represent. It passes the Band’s music along, encouraging more fans and musicians to discover more about one group’s contributions to America’s expanding musical tradition. ©Copyright 2007 by David Hyland. All rights reserved. This material may not be published, broadcast, rewritten or redistributed. Tags: album, Allman Brothers Band, Death Cab For Cutie, Guster, Joe Henry, Lee Ann Womack, Levon Helm, My Morning Jacket, Robbie Robertson, Rosanne Cash, The Band, tribute, Widespread Panic. Bookmark the permalink.